BC Budget 2019 delivers modest new investments in two key areas—poverty reduction and climate action—and maintains momentum on other files that implement the ambitious investments announced last year. Here are our highlights, fresh from the lockup. The flagship announcement of BC Budget 2019—and likely of the upcoming first-ever BC poverty reduction plan—is a new, more generous BC Child Opportunity Benefit for children under 18 that will replace the existing BC early childhood tax benefit (which only applied to children under six years old). The new benefit will be introduced in October 2020, paying up to $1,600 per year for one child—a considerable increase from the current $660. Families with two children will receive up to $2,600 and those with three, up to $3,400. The benefit will not be clawed back from children whose parents are receiving welfare. However, with rates remaining thousands of dollars below the poverty line even with the new $50 increase (more on this below), this new benefit will not be sufficient to lift families on welfare out of poverty. The new benefit will be income-tested with the maximum amount applying to low-income families earning less than $25,000, and will be clawed back for parents with higher incomes. Families with incomes up to $97,500 will receive the benefit. This tax benefit will be delivered through the tax system and will be fully refundable, which means that families who owe no taxes will receive a cheque from the provincial government. It is estimated to cost $250 million per year when fully implemented. The new BC Child Opportunity Benefit is great news for low-income families with children and is expected to reduce the child poverty rate in the province once its fully phased in. The new BC Child Opportunity Benefit is great news for low-income families with children and is expected to reduce the child poverty rate in the province in 2021, once it’s fully phased in. It is unfortunate, however, that low-income children and their families have to wait a year and a half before they will see any benefits. And while the $1,000 extra benefit for one child is much-needed, the only families who will be lifted out of poverty by this new benefit are those that are $1,000 to $1,500 below the poverty line to begin with. BC has some of the highest levels of poverty in Canada for all age groups. In a wealthy province like ours, such poverty and homelessness is unfair and unnecessary. It is also extremely expensive. The CCPA has calculated that poverty costs BC between $8.1 and $9.2 billion annually. Poverty puts people at higher risk of diabetes, obesity, heart and respiratory disease and other chronic conditions. We all pay for poverty and homelessness in higher healthcare costs, lower school success, higher criminal justice system costs and lost productivity. This is why the pending poverty reduction strategy is so urgently needed. BC Budget 2019 lays the foundation for the forthcoming poverty reduction strategy by introducing a range of investments in areas that will support very vulnerable populations and address some major inequities that exist for foster children and children with special needs. These measures represent smart investments across the seven pillars of a comprehensive poverty reduction strategy as outlined by the CCPA and the BC Poverty Reduction Coalition. While they don’t cost much in budgetary terms—and many won’t make the news headlines—they are very significant and will improve the lives of some of BC’s most vulnerable residents. Increased financial support for children in the foster care system, including increasing the funds available for extended family caregivers to match those available for foster parents. This is particularly significant for Indigenous children, who make up a large share of children in BC’s foster care system. In addition, provincial child benefits will be extended to children in foster care—something not previously available. Extra supports for parents whose children have special needs. Funding to remove barriers to access to social assistance and disability assistance. Improvements to employment training programs delivered by WorkBC. Funds for improved access to justice, including new Indigenous legal clinics. Additional funding to increase access to adult basic education and English language training. A small funding boost for trades training. Money to bring high-speed internet access to 200 rural and Indigenous communities this year. Funds for BC transit to improve bus services in over 30 communities around the province, including handyDART improvements. Increased mental health and addiction services for children and youth. Additional funding to the Employment Standards Branch to update employment standards. We’re hopeful this includes money for enforcing workplace rights, which for many vulnerable workers currently only exist on paper. The new increase of $50 per month to welfare and disability rates is welcome, but even with this raise, welfare and disability rates will remain thousands of dollars below the poverty line. Benefits for single, employable individuals will continue to be less than 50% of the poverty line (as measured by the Market Basket Measure) and benefits for a single individual on disability assistance will increase to a measly 65% of the poverty line. More substantial investments in poverty and homelessness are needed to reduce deep poverty in our rich province and we hope to see more announcements for future years embedded in the forthcoming poverty reduction strategy. With Budget 2019, BC continues to be ahead of other provinces on climate action, but behind compared to the actual scale of the climate change emergency. As the United Nations recently warned, time is running out and a massive transformation is needed by 2030 to reduce emissions and limit the damage. The budget provides $679 million in funding for the CleanBC climate plan that was announced in December. These include a combined $81 million for home retrofits and efficiency upgrades for public buildings. There is also $42 million for extending BC’s rebate and incentive program for the purchase of zero-emission vehicles (ZEV) as well as $20 million to expand the network of electric vehicle charging and hydrogen fuelling infrastructure. The announcement of the CleanBC plan, including funding for some of its elements, is a crucial step forward on climate action. But action needs to be ramped up—and fast. A criticism of ZEV rebate programs is that they often end up being a subsidy to affluent consumers who would likely purchase these vehicles anyway. Also included is $168 million to fund an incentive program to encourage large industrial polluters to reduce their emissions and $299 million for unspecified future climate action initiatives over the three-year fiscal plan. A separate and additional $223 million is budgeted to increase the climate action tax credit for low- and middle-income earners—an important fairness measure as the carbon tax increases. Fundamentally, there is a deep tension in BC’s climate plan, which has to make room for the large emissions expansion associated with the recently confirmed LNG Canada project. Consequently, emissions reductions in other areas of the economy will have to compensate for the expansion of the fossil fuel industry. This is one of the crucial reasons the CleanBC plan currently only accounts for about 75% of the emissions reductions needed to meet BC’s reduction targets. The plan promises that further initiatives will be fleshed out over the next 18 to 24 months to fill this gap. The announcement of the CleanBC plan, including funding for some of its elements, is a crucial step forward on climate action. But action needs to be ramped up further—and fast. If any jurisdiction is well positioned to rapidly transition to a carbon neutral economy, it’s British Columbia. We are an extremely wealthy society, with massive existing hydro power assets that serve as the backbone of our electricity system. BC should heed the call of the UN climate change panel, raise our ambitions further and demonstrate the kind of leadership that can inspire other jurisdictions. Shifting to a clean economy is also crucial to position BC as an economic powerhouse for the long term. Budget 2019 fulfils an election promise to eliminate interest on provincial student loans. BC now joins Manitoba, Nova Scotia and Prince Edward Island to provide interest-free provincial student loans (Newfoundland and Labrador offers non-repayable grants, which is slightly better). This is estimated to cost the Province $318 million by 2021/22. In other words, students with outstanding student loans will save a total of $318 million in interest. This is great news for lower-income students who rely on student loans to finance their education and often end up paying thousands of dollars in interest more than students whose families can afford their education costs. When the needs and opportunities for investment are so large, focusing on short-term budgetary savings means neglecting long-term economic and social costs. These investments are relatively small on the scale of the budget, but they will make significant changes in the lives of some of the most vulnerable British Columbians. Budget 2019 announces funds for new revenue-sharing agreements with BC First Nations for $297 million over three years. The funds will be available to First Nations to invest in priorities to support their communities, and the Budget does not include much detail on how the money will be distributed but this is an important initiative to watch. Big picture, the BC government is making significant increases in capital investment—an increase of 33% since last year, on top of a 22% increase the previous year. This compares to much smaller annual increases prior to that. We must ensure that the new infrastructure is green and contributes to a sustainable future economy. As the real estate market cools down and our economy becomes less reliant on real estate, these major new capital investments represent a significant jobs plan—jobs to build and staff new hospitals, community health centres, child care facilities, seniors residences and infrastructure the province needs like new bridges, highways, transit lines and new retrofit programs under the Clean BC climate plan. Housing was a major focus of last year’s Budget, which contained an impressive series of measures to reduce speculation, tax the wealthiest landowners and build badly needed new affordable housing units. While the investment in new housing was at a record level, the crisis is so severe that more action is still needed. Budget 2019 adds to this multi-year investment plan, though only modestly. New investments include is a small expansion of the Province’s successful modular housing program to fund 200 additional units beyond the 2000 announced last year as well as $15 million to develop a province-wide homeless response strategy over the next three years. In a province as rich as ours, it’s simply unacceptable that people are still forced to live on the streets. The rapidity with which modular housing units have been brought online is a reminder that it is entirely within our grasp to eliminate homelessness if this is prioritized. When government estimates suggest 7,700 British Columbians are homeless, investments should be scaled up urgently to ensure there is a home for everyone. While the investment in new housing was at a record level in last year’s BC Budget, the crisis is so severe that more action is still needed. Budget 2019 adds to this multi-year investment plan, though only modestly. Other measures include accelerating $38 million in grants to housing providers in the 2018/19 fiscal year that ends on March 31 as well as $10 million to establish a provincial rent bank (which is welcome, but ultimately a band-aid solution in the context of a major housing crisis). More broadly additional investments are needed to meet the government’s target of 114,000 new housing units over 10 years. As of last year’s budget, the government outlined specific commitments to create 34,000 new homes over 10 years and Budget 2019 does not yet begin to substantially bridge the gap to achieve the 114,000 unit target. The target itself should also be increased, particularly as it is designed to include market housing. We have argued that there’s a need for 10,000 units per year of social and cooperative housing in Metro Vancouver alone. Public investments in affordable housing are to a large extent self-financing as they create a stream of rental income over the life of the housing unit. Additional funding is then needed to ensure affordability of the units, which can be raised through additional progressive property tax reforms. If we publicly captured even a fraction more of the $1 trillion in increased property wealth in the province since 2007 (wealth that is extremely unequally held), this would create major possibilities for additional investment in affordable housing. BC, and Vancouver in particular, have unusually low property taxes, which not only mean forgone public revenue but also help fuel speculation in the housing market. Finally, we would have liked to see relief for renters by eliminating the Home Owner Grant and replacing it with an income-tested grant that goes to renters and owners alike. The new investments in Budget 2019 are very welcome and an important change from years of inadequate social spending under the previous government. But in a province where people are struggling with issues of unaffordable housing and child care, the need to care for aging family members and extensive poverty, it’s time to increase the scale of our ambition and investment. Even after the new investments we’ve seen, opportunities to go further have been left on the table in Budget 2019. Large projected surpluses, contingencies and forecast allowances remain in the budget, amounting to a combined $1.5 billion in 2019/20 and $1 billion in 2020/21. Even these figures are based on conservative assumptions about economic growth, which are below average private sector forecasts. In fact, provincial government operating spending in BC still remains low as a share of our total economic pie. 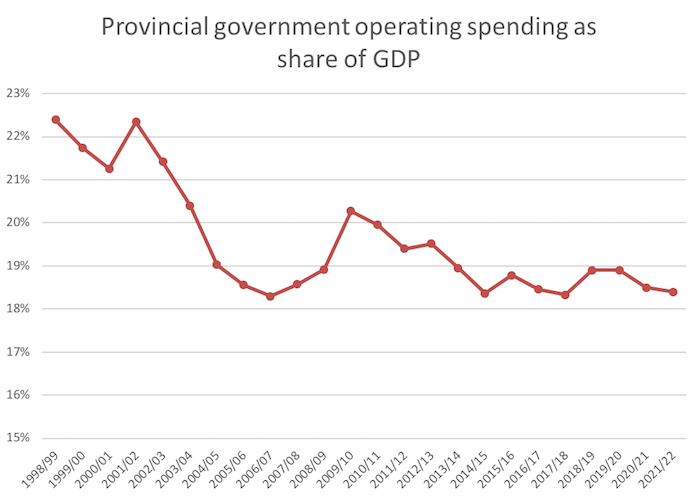 In 2000/01, we were spending 21.3% of GDP in the provincial budget compared to a projected 18.9% in 2019/20. Strikingly, if we dedicated the same share of our economy to public spending today as we did in 2000, we’d have about an additional $7 billion to invest in urgent social and environmental priorities. When the needs and opportunities for investment are so large, focusing on short-term budgetary savings means neglecting long-term economic and social costs. For example, poverty costs the BC economy $8-9 billion per year. Lack of affordable child care keeps many young parents out of the workforce, which translates into hundreds of millions of dollars in lost economic output. Lack of affordable housing hurts households and makes it difficult for businesses to recruit workers. Going big on public investments in housing, child care, poverty reduction and climate action is not only the right thing to do, it is also good for the province’s economy and finances. Related, as inequality in BC has reached extreme levels, additional action is needed to ensure the high-income earners and the wealthy landowners pay more to help fund these initiatives. While last year’s budget made some major progress in terms of tax fairness, Budget 2019 is quiet on this front. Going forward, BC should look at expanding fair tax reforms. One measure we have recommended is adding a new top income tax rate of 22% on incomes over $250,000—roughly the top 1% of earners. Budget 2019 boosts funding to BC’s public health care system by $1.3 billion over the next three years, including supports to the BC Children’s and Women’s hospitals, the BC Cancer Agency and adding coverage for new drugs to the PharmaCare program. This comes after a range of important commitments made last year, including major investments in seniors’ care, urgent primary care centres, PharmaCare coverage for low income earners, reducing surgical wait times and increasing access to diagnostic services like MRIs. But more funding is still needed to develop the health care workforce, as well as roll out team-based community health centres. Overall, health care spending remains sustainable, and in fact is projected to fall from 7.8% of GDP in 2011/12 to 7.2% 2021/22. There is room to increase investments where needed. The budget also adds $74 million over three years to increase mental health and addiction services, and a $30 million increase to respond to the opioid overdose emergency (building on $578 million already funded since the budget update in September 2017). But amid an overdose crisis that is taking an average of four lives in BC every single day, the government should provide any and all additional resources needed to save lives, including ensuring those suffering with addictions have access to a safe, reliable supply of opioids (as opposed to a toxic, unpredictable street supply). Some money for health care providers training (though not enough to meet the sector’s large recruitment and retention needs). Additional spaces for early childhood educator programs in public post-secondary institutions. Investment in technology training programs. Funds to establish an independent oversight unit in the Ministry of Energy, Mines and Petroleum Resources. Gender Based Analysis Plus—the Budget recommits to implement equity analysis of new provincial government programs through a GBA+ framework. BC ferry fares will remain frozen for another year. This measure makes it easier for island residents to get around, for island businesses to restock supplies and get their goods to market, and provides a stimulus for the tourism industry in ferry-dependent communities. A province-wide homelessness action plan, which includes funds for a province-wide homelessness count in 2020, a new homelessness coordination unit and building 200 modular housing units. While the new modular housing units are welcome (and come on top of 2,000 units announced last year), we know there are at least 7,700 homeless people in the province—so this is obviously not going to solve the homelessness crisis. We can and should do much better.